Definition at line 150 of file knowledge.c. How many items are allocated for items. Definition at line 154 of file knowledge.c. Referenced by free_knowledge_items(), knowledge_add(), and knowledge_read_player_data(). How many items this players knows. Definition at line 153 of file knowledge.c. Referenced by free_knowledge_items(), knowledge_add(), knowledge_do_attempt(), knowledge_do_display(), knowledge_god_add(), knowledge_item_can_be_used_alchemy(), knowledge_known(), knowledge_process_incremental(), knowledge_read_player_data(), knowledge_show(), and knowledge_write_player_data(). Definition at line 152 of file knowledge.c. Referenced by free_knowledge_items(), knowledge_add(), knowledge_do_attempt(), knowledge_do_display(), knowledge_give(), knowledge_god_add(), knowledge_item_can_be_used_alchemy(), knowledge_known(), knowledge_process_incremental(), knowledge_read_player_data(), knowledge_show(), and knowledge_write_player_data(). Next player on the list. Definition at line 157 of file knowledge.c. Referenced by free_knowledge(), knowledge_alchemy_can_use_item(), knowledge_alchemy_detail(), knowledge_first_player_save(), knowledge_get_or_create(), and knowledge_process_incremental(). Definition at line 151 of file knowledge.c. 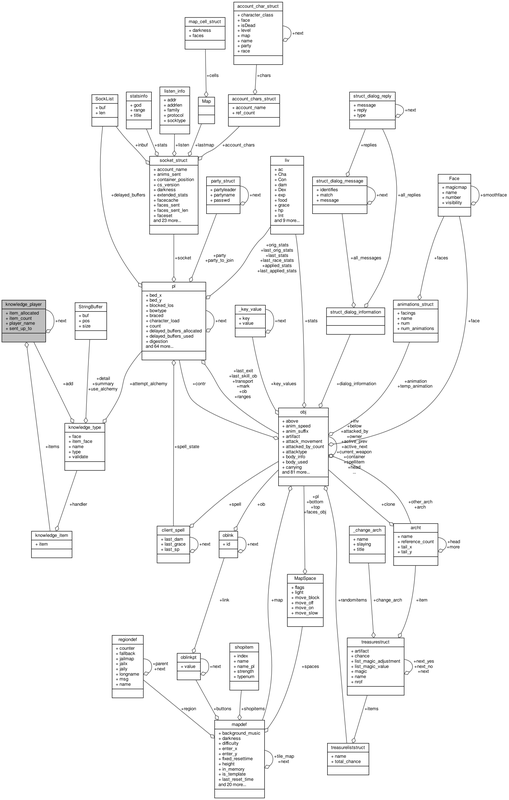 Referenced by free_knowledge_player(), knowledge_first_player_save(), knowledge_get_or_create(), knowledge_process_incremental(), knowledge_read_player_data(), and knowledge_write_player_data(). Largest index that was sent to the client with notifications, -1 means the client doesn't want this information. Definition at line 155 of file knowledge.c. Referenced by knowledge_get_or_create(), knowledge_process_incremental(), and knowledge_send_known().